The awards banquet was well attended. 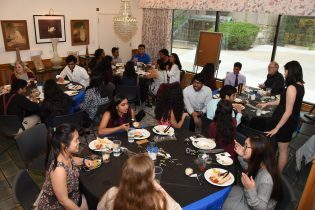 Hundreds of student volunteers were recognized May 8 at the annual Sojourner Clinic Banquet, which was held at the Diastole Scholars’ Center. Students put in more than 1,500 volunteer hours each year treating more than 300 patients in more than 800 patient visits at the clinic, which offers free care to the homeless in downtown Kansas City. More on the clinic and award winners is here.